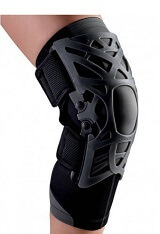 Donjoy knee braces are some of the most popular braces on the market. They are top of the range braces using specially designed hinges, springs and frames. Donjoy braces are regularly used in hospitals and by professional athletes and they are known for providing excellent support. Why Choose Donjoy Knee Braces? Donjoy knee braces are the ultimate in protection. Donjoy has been a market leader in non-operative orthopedic products for over 30 years, and has pioneered innovative brace designs and technologies to help professional athletes and active individuals prevent and rehabilitate from knee injuries. They are so confident in their products that they have even set up the first and only knee guarantee programme. But, if you are looking for a basic brace to provide some support and compression, you can probably find a cheaper, suitable brace from another manufacturer such as McDavid or Mueller. You will find information on how the different braces work, what they are suitable for and can read user reviews to help you find the right brace for you. If you are having problems with stability of the knee from ligament damage, are recovering from knee surgery, or are looking for a brace to reduce the risk of injury, Donjoy knee braces offer the best protection. Most knee instability is caused by damage to the ACL, as the ACL is the primary stabiliser of the knee. The ACL is most prone to damage is the last part of knee extension (the last 60o), known as the “at-risk” position. As the knee gets closer to full extension, that is when the force going through the ACL causes the most damage. 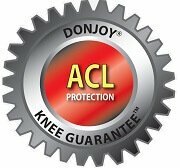 Donjoy braces are specially designed to reduce that force, decreasing the overall strain on the ACL. Rather than a simple flexion/extension hinge, it uses a spring mechanism to provide gradually increasing resistance to the knee as it reaches the “at-risk” positions. This slows down the acceleration of the knee in the last 25o of extension, reducing the risk of injury. You can choose the amount of resistance applied depending on your activity levels to make them suitable for anything ranging from everyday use up to professional, extreme and contact sports. This is all about the frame design. These Donjoy braces have a rigid frame that at the top comes round the front of the thigh to anchor the femur, goes down the sides of the knee joint and then curves round behind the back of the calf at the bottom to anchor the tibia (shin bone). There are then flexible straps across the front of the thigh and the back of the calf which prevent anterior tibial translation (the tibia gliding forward) which is what tends to cause ACL injuries. This design on Donjoy braces provides dynamic stability through the entire range of movement. Overview: This brace is perfect for those who enjoy contact or extreme sports – it is the strongest off-the shelf brace Donjoy make. It is designed for use with moderate/severe ACL/PCL/MCL/LCL instabilities, hyperextension or after ACL surgery. The Donjoy eXtreme Armor provides great protection and support through full knee range. It combines the FourcePoint hinge and Four Points of Leverage™ System for maximum stability. If needed, you can limit knee range, choosing from three options (25-0, 35-10, 45-20). The super lightweight frame is made from aircraft grade aluminium, and is lined with “anti-migration” pads to hold the brace in place. The calf is short allowing good boot clearance, and the internally mounted straps mean that if you need to wear a brace on both sides, they won’t catch on each other. My Verdict: For highly active people, skiers and extreme sports enthusiasts this brace is the bee’s knees. It is designed for those people who want to go all-out! To quote Donjoy it provides “Indestructible Protection”. Overview: This Donjoy knee brace is designed for use with mild-moderate ligament instabilities and is suitable for court and non-contact sports, or when recovering from ligament reconstruction. It combines Donjoy’s proven Four Points of Leverage™ System with its patented FourcePoint hinge technology to protect the ACL. The Donjoy Fullforce knee brace has a sleek, low-profile design, and is exceptionally light-weight. It also has a short calf length which many people prefer. It is suitable for competitive and recreational athletes as well as everyday use. 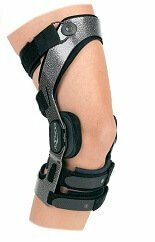 Overview: This Donjoy knee brace is for moderate/severe ACL, PCL, MCL, LCL and meniscal instabilities. It can be used for contact sports and is safe for salt and fresh-water activities. It has a low-profile design so can be worn underneath most clothing. The Donjoy Legend has a 10o extension block fitted to prevent hyperextension, a common cause of ligament injuries. 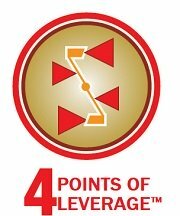 It also combines the Four Points of Leverage™ System and FourcePoint hinge technology. There are three versions: ACL, PCL or combined. It is the same brace but with different strap locations depending on where you need the support. 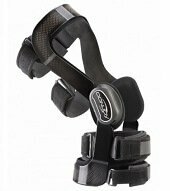 Overview: This brace is for mild/moderate knee instability following partial or complete tears of the ACL, PCL, MCL and/or LCL. It has a hi-tech, simple to use pin system that allows you to control how much the knee bends and straightens by locking the brace at nine different positions between 0 & 90 degrees. This is perfect if you want to block specific knee movements to provide protection e.g. following knee surgery. My Verdict: This is one of the cheaper Donjoy knee braces as it doesn’t use a solid frame like the other styles and has a simpler polycentric hinge. It is very easy to apply and change the restrictions on movement. The Donjoy Playmaker is most commonly used after knee surgery or with ACL injuries and receives good user reviews. There is a newer version available in the US. Average user rating 4.4/5. There are a number of braces on the market that can help with anterior knee pain, most commonly due to kneecap problems known as patellar maltracking. Donjoy have produced a great brace, designed by an orthopedic surgeon which is unique in how it works to take forces away from the kneecap. Overview: This donjoy knee brace was specially designed for people suffering from anterior knee pain (kneecap pain) caused by conditions such as chondromalacia patella, patellar tendonitis, Osgood-Schlatters, mild osteoarthritis, and patellar tracking problems. The Donjoy Reaction has a special elastic web design featuring membranes that elongate with movement and then return back to normal which absorbs shock, redirects forces away from the painful parts of the knee as well as stabilising the kneecap and holding it in the best position. It can be worn for daily activities and sports. It is very comfortable to wear as the design makes it breathable and there is a removable anti-sweat breathable sleeve. Available in a wide range of colours. My Verdict: I love how this brace deflects the forces directly away from the kneecap. People report instant relief when wearing it and say it is tight but comfortable. For those troublesome causes of anterior knee pain that just won’t settle down, this is definitely worth a try. Average user rating 3.8/5. There is a specific range of donjoy knee braces suitable for arthritis that can work really well to reduce pain, improve function and delay the need for surgery. They work by redistributing the way the forces go through the knee from the affected parts to the healthy parts of the knee. My favourite Donjoy knee braces for arthritis are the OA Lite, OA Assist and OA Everyday. They receive the best reviews from arthritis sufferers. 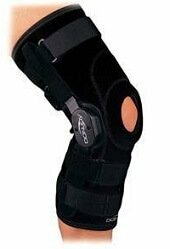 To find out more about how these braces work and to read reviews, go to the arthritis knee brace section. 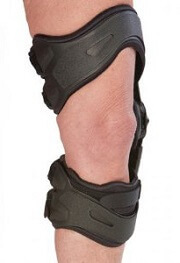 When using Donjoy knee braces, it is essential to get the right size. Too small and it will quickly become uncomfortable, too large and it won’t provide the support and stability that you need. They come in seven sizes ranging from XS to XXXL. To get the right size from you, you will need to take three measurements, preferably in standing with your knee slightly bent and your muscles tense. 3) Calf: Go 6 inches down from the center of your kneecap and measure the circumference of your calf at that point. If your measurement indicates two different sizes, it is recommended that you opt for the larger size.